Hey! Long time no write. Constant schoolwork and general lethargy on my part have meant that drawing time is few and far between; however, I managed to rise up from bed to make another concept of a flower-themed hero design I've had in mind for a while. This design is of one of my characters who I draw often, a delinquent named Maurice. He's one of those characters I go to whenever I'm stuck. So yeah, it's inspired by amaryllis belladona. I'm thinking of making the costume match the color of the flower better. I've finished Ted Naifeh's Princess Ugg recently and I thought it was pretty cool. I'd read a couple of his Courtney Crumrin novels before and liked them a lot so I'm not surprised that I also enjoyed Ugg. The story's pretty basic: it's about a strong and somewhat violent princess who's living alongside some vapid, well-kept princesses so she can learn to be a "true princess". Still though, Ted Naifeh's art skill is what draws me in. His line work and watercolours are so beautiful. I guess I can be kinda vain when it comes to art but I tend to like comics with well drawn people (facial expressions and body language). Kinda random but I especially love that he draws men as pretty as his women characters. (Also that Ulga is short and beefy! It's not something you see often in works created by dudes). Somewhat related: I really hoped that the live-action Wonder Woman was stocky and beefy too. I wasn't able to see the movie because $$$ but I'm of the opinion that Gal Gadot just wasn't muscle-y enough for the role... When I look at her I don't really see a warrior goddess but a physically fit runner-athlete? However, that's an unpopular opinion for another day (or lifetime). Anyway, as for drawing, I've only been able to manage doing some studies here and there. I notice that I've not been good at varying hairstyles so I used the UK Hairdressers site to practice some. Since I was practicing hairstyles and textures, as well as improving my speed, I was happy with these results. Guess that's it for today. I'll probably update this blog twice a week? Depends on if I have anything to say haha. Anyway, til next time. I'm thinking about using this blog feature as a sketchblog wherein I can post sketches and talk about art-related things since I don't really have a space for that in my day-to-day life (North Carolina isn't big on comics or illustration so here I am?). Recently I've been drawing some old characters from a superhero story I've had on my mind since 2014, back when I was obsessed with hero shows like Kamen Rider and Super Sentai. I keep thinking that it'd be nice to actually work on making the story a reality but I'm not a confident artist... So in the meantime I work on small pieces that explore the characters, their personalities, and their environment. The main cast of heroes. 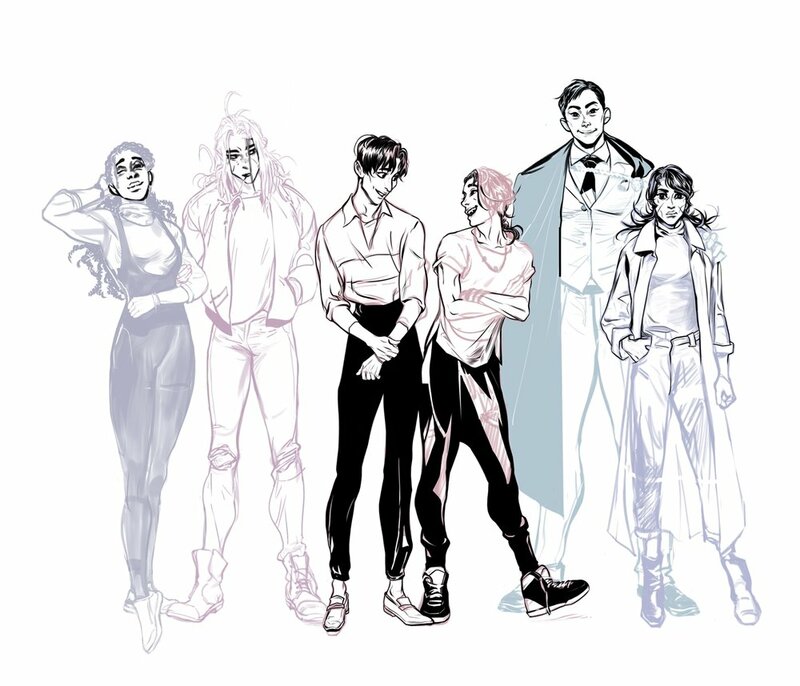 From left to right, their names are: Nadja, Maurice, Paolo, Sun, John Iwa, and Alba Tourmaline. Other than some recent sketches, I've added some of my old "Paolo and Sun" comics to the portfolio if you'd like an idea of what kind of people these guys are. Rethinking Sun and Paolo's hero design (as well as one of Sun's abilities). SunxPaolo and one of the villains, Jet. Something from January that didn't go anywhere. Art and design © Mariel Hester, 2019. Contact me at genmode93@gmail.com.